For the first time, physicists have used laser light to create "synthetic magnetism," an exotic condition in which neutral atoms suddenly begin to behave as if they were charged particles interacting with a magnetic field -- even though no such field is present and the atoms have no charge. The achievement provides unprecedented insights into fundamental physics and the behavior of quantum objects, and opens up entirely new ways to study the nature of condensed-matter systems that were barely imaginable before. There are many phenomena of urgent interest to physicists, such as the action of electrons restrained in two dimensions in a magnetic field, that are difficult to investigate in conventional materials such as semiconductors. Not only is it hard to control the numerous variables involved, but there are always defects and irregularities in the experimental samples. Nonetheless, such research is important both to basic quantum mechanics and to applied fields such as quantum computing and information science. Synthetic magnetism provides a way to model and examine such quantum systems while exercising precision control over the parameters. A small, spatially varying, magnetic bias field was applied across the BEC, producing a gradient that affected the atoms differently depending on their position along one axis of the trap. [See Figure 1] Then two near-infrared (wavelength, λ=801.7 nm) laser beams, oriented at 90 degree angles to each other, were aimed into the atoms. The scientists adjusted the beams to have very slightly different frequencies. 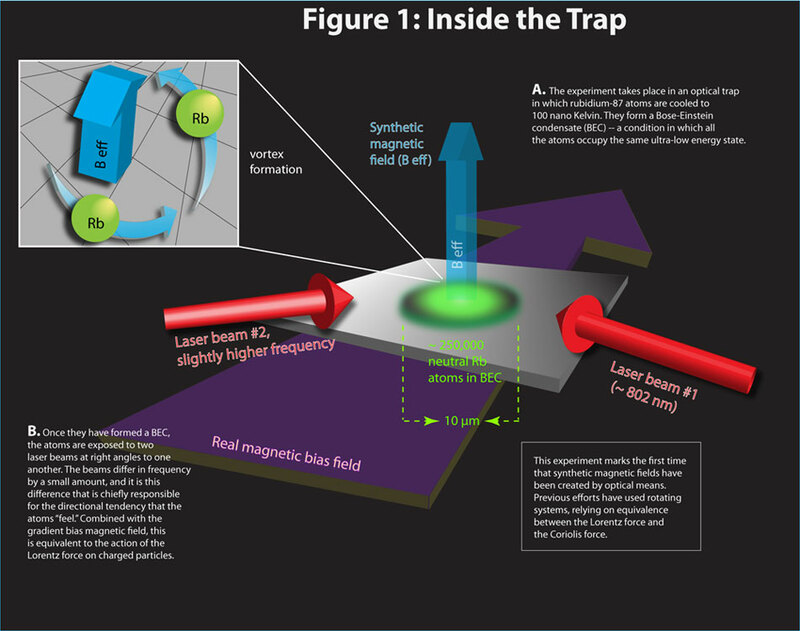 The cumulative effect of the gradient field and the two laser beams altered the properties of the atoms (in particular, their momentum along one axis) in a way that depended on their location in the trap and their interaction with the beams. 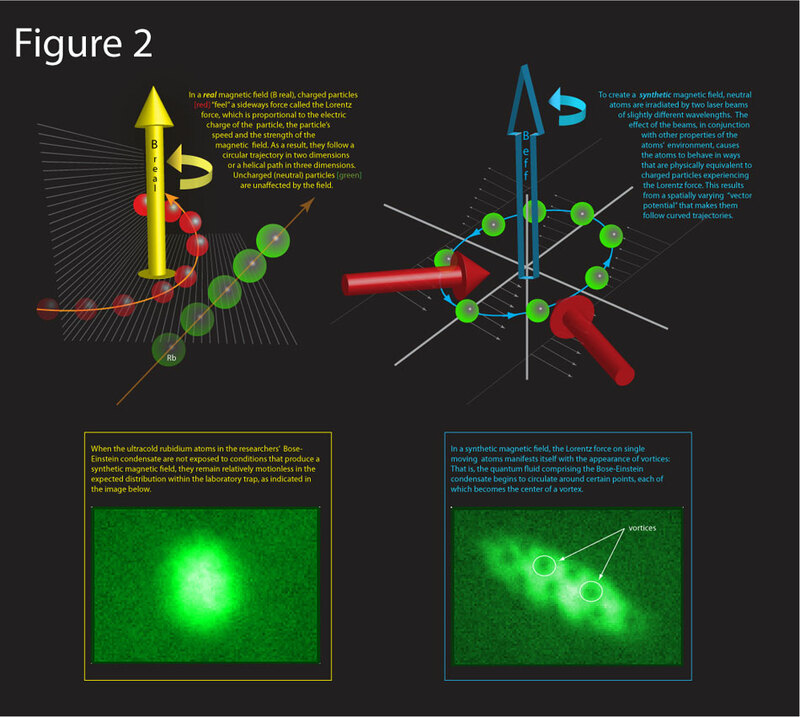 Those differences, the researchers found, could be tuned by making slight changes in the frequencies of the laser beams, in effect conferring a “charge” on sub-populations of the neutral atoms and creating a synthetic magnetic field to which they reacted. By varying the beams and the gradient, and thus controlling the position-dependent momentum potentials of the atoms, the team observed that – as predicted in a theory paper Spielman had authored earlier this year – atoms at specific points in the trap began to move in a way mathematically equivalent to the way a charged particle would revolve in a magnetic field. The effect caused small quantized vortices of atoms to enter the BEC. [See Figure 2 ] To confirm and measure the magnitude of the phenomenon, the team took pictures of the BEC approximately 25 milliseconds after shutting off all fields and beams in the trap. Images of the expanding atomic cloud clearly showed that when the synthetic magnetism was not present, the atoms in the BEC had the customary distribution. But when the synthetic field was activated, vortices were plainly visible – a clear indication that an optically induced synthetic magnetic field had been created for the first time. In addition, synthetic magnetism should prove valuable in characterizing aspects of the quantum Hall effect, a phenomenon observed in two-dimensional systems of electrons in a magnetic field. In that situation, the electrons naturally tend to follow circular (“cyclotron”) orbits; and the energy levels of those orbits are quantized. The National Institute of Standards and Technology uses the quantum Hall effect to define the international standard of resistance. Further improvements on the synthetic magnetism work, Spielman says, should allow new ways to investigate these and other phenomena. The research was partially supported by the Office of Naval Research, the Office of the Director of National Intelligence, the Army Research Office and the National Science Foundation through the NSF Physics Frontier Center at the Joint Quantum Institute. 1 The Joint Quantum Institute is a research partnership between the National Institute of Standards and Technology and the University of Maryland, with support from the Laboratory for Physical Sciences.